You may notice a theme here if you’ve looked around a bit already – I like to see the innards of my systems. If there’s a “clear”, “crystal” or “skeleton” color variant, I’ll usually buy it. This was my second Game Boy and the first one I really wanted. I got it for Christmas shortly after it was first released; the addition of color made it a bit more acceptable to me than the original Game Boy, and by this time there were some games I actually wanted. I probably couldn’t add anything about the GBC that you wouldn’t already know, so I don’t have much to say about this system. It did get a fair amount of play from me and the screen is pretty scratched up (battle scars! ), but these days it sits in its box, relegated to a drawer in favor of its newer incarnations. If it looks backlit, it’s just a trick of the light. It’s not. It’s a good screen, though. 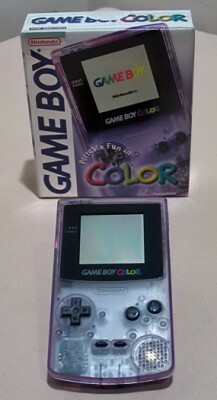 Love the Game Boy line, especially the Pocket and the Color. That’s a great picture, too. 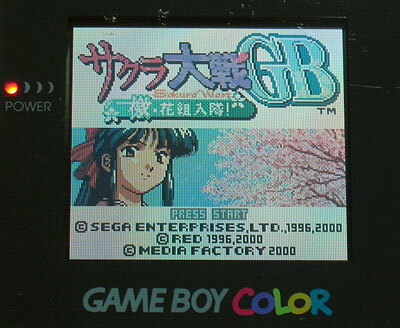 Wish I could get my shots of the GBC’s screen to come out that good.